It's safe to say that Android tablets will never be a thing. It's safer to say the Lenovo Tab 4 8 Plus and the Home Assistant Pack will never replace anyone's Echo home speaker. It's hard to figure out Lenovo's strategy here. While Apple has carved out a nice niche with the iPad, and Chromebook makers are beginning to experiment with keyboard-less models, Android-based tablets never really caught on with fans of the platform who were content with using their larger-screened phones to get things done. 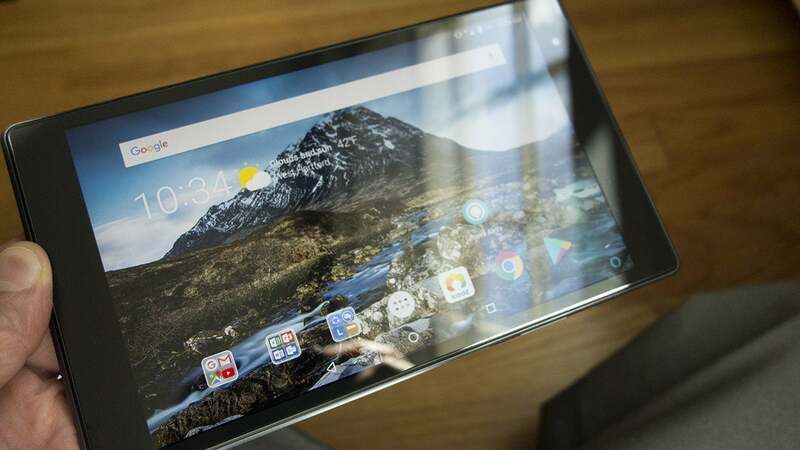 For $230, however, the Tab 4 8 Plus (OK I'll stop writing that now) isn't a bad tablet at all. But it's not a very good one either. There are huge bezels and seams all around and an oddly positioned USB-C port. Its camera isn't worth writing about. The best feature of the Tab 4 is the screen, which is retina quality and a sight better than most other 8-inch "HD" tablets with 1280 X 800 screens. But it picks up fingerprints very easily and its glossy veneer makes it very tough to read in bright or overhead lighting. The tablet is running Android Nugget with no indication from Lenovo that an Oreo update is coming anytime soon, but at this point who cares? While Oreo's picture-in-picture would be nice on a tablet, the Tab 4's split-screen abilities should be enough for multitaskers. Besides, the Tab 4's Snapdragon 625 processor is far from the speediest, so you'll be best to stick with light tasks. The speakers on the Lenovo Tab 4 8 Plus have Dolby Atmos support and sound great. While performance is eh, battery life is excellent, with strong screen-on and screen-off performance. Streaming a 2-hour movie over Netflix cost just 17 percent of the Tab 4's battery life, and it barely lost any juice when in standby mode for days. The front-facing Dolby Atmos speakers sounded fantastic when watching said movie. It's also equipped with a SIM slot for LTE, a nice addition for a cheapish tablet. Lenovo hasn't done too much to modify the Android tablet experience, but there are two notable app additions. The first is Kidoz, which lets you set up a new user with a child profile that launches kid-friendly environment with time and content restrictions. 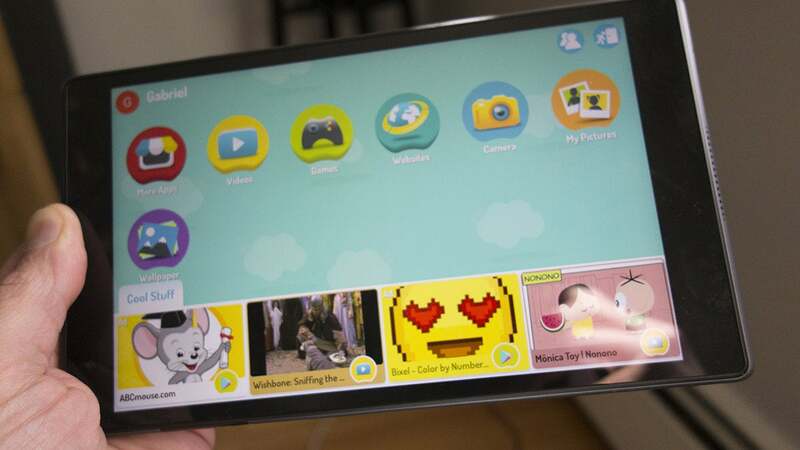 The candy-colored interface is geared more toward toddlers than tweens, but it's nonetheless a good tool for parents who don't have time to look over their kids' shoulders when they're playing on their tablet. Toddlers will love the Kidoz app on the Lenovo Tab 4 8 Plus. The other is the Lenovo Alexa app, and it's here where the Tab 4 tries to set itself apart from the rest of the 8-inch Android tablet crowd. 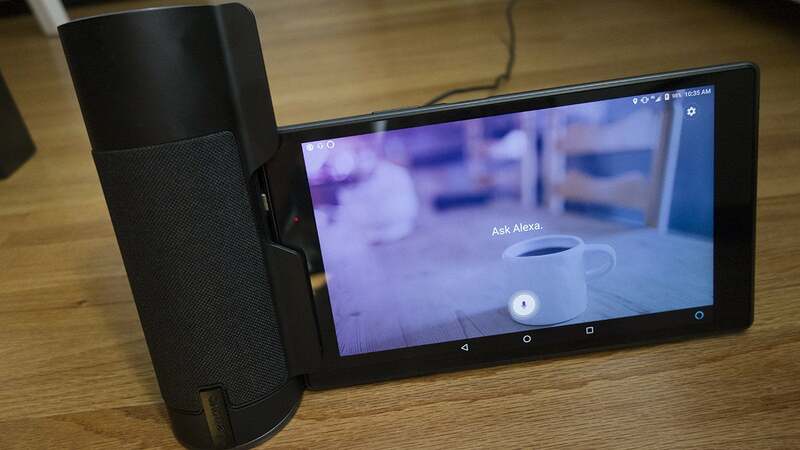 While the app itself is a standard porthole to Amazon's AI assistant with support for several languages, the Tab 4 is also compatible with Lenovo's $80 Home Assistant Pack, which turns your tablet into a hands-free smart speaker with a screen. On its own, the Home Assistant Pack is a neat device. Since it's made to fit all of Lenovo's Tab 4 tablets and they all have different connectors, it comes with swappable ports (micro USB and USB-C) and a swivel base that ensures the tablet's proper orientation. Lenovo's Home Assistant Pack includes a swappable port for each of the Tab 4 models. 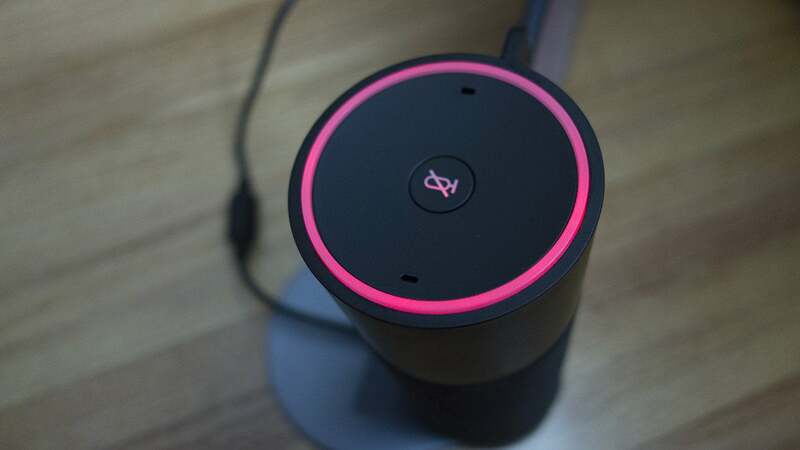 Standing about 7.5 inches tall and featuring a 360-degree grill, the speaker portion of the dock looks something like an Amazon Tap, and at 300 grams, it's not much heavier than Amazon's portable speaker either. The Home Assistant Pack cradles the Tab 4 horizontally, so it's a bit flimsy, though it does rest firmly on a desk or counter (as long as you don't touch it). 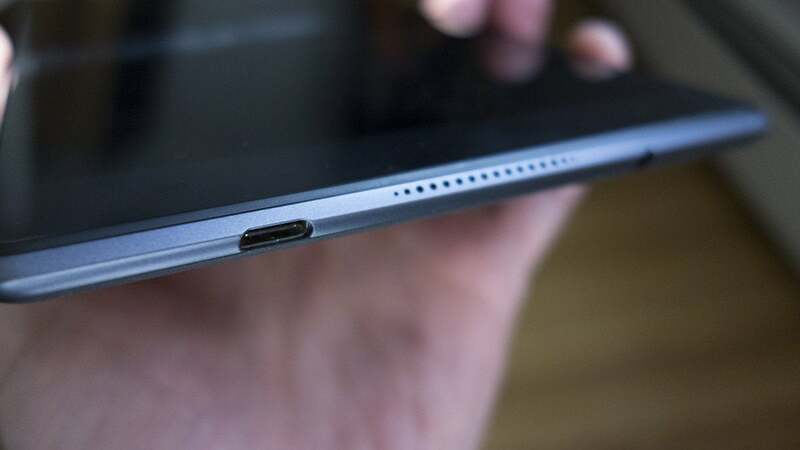 The silver USB-C port it's attached to is ugly and distracting and consistently made me think the Tab 4 wasn't properly connected. A switch at the top lets you mute Alexa's microphones, and a standard 12-volt plug simultaneously powers the speaker and charges the tablet, so you'll never have to worry about it running out of juice. 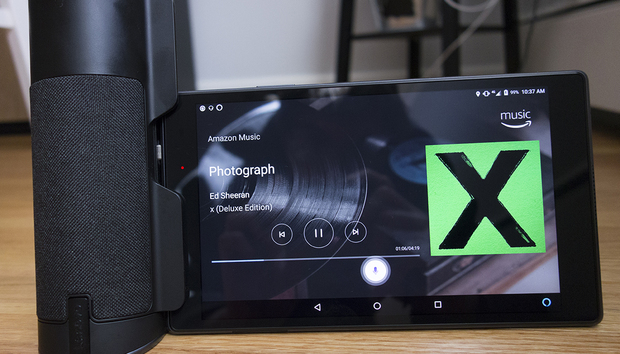 When attached to the dock, the screen switches to the Alexa app (after a warning notification about using the microphone), so you'll only have to touch the screen to tweak the settings or access Android proper, but that kind of defeats the purpose. The Home Assistant Pack is meant to turn your tablet into the screen of an Amazon's Echo Show. You can mute Alexa's microphone's by tapping the top button like on an Echo. 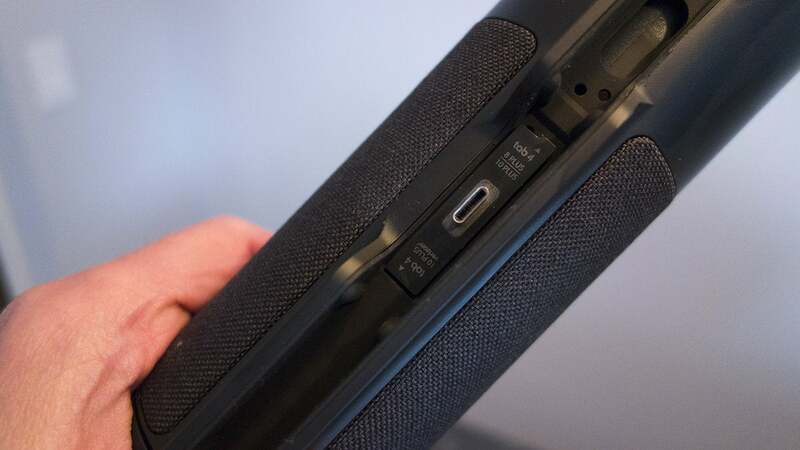 To that end, the dock's speaker is equipped with a pair of far-field microphones so it's always listening for the tell-tale wake word, Alexa (which can't be changed). That's a downgrade from the seven microphones inside the Echo and eight inside the Echo Show, so you'll need to be relatively close for it to hear you (and even then, it's kind of hit or miss). Once it hears you, the screen turns on and a blue bar at the bottom lets you know it's ready to answer your command. Alexa on the Tab 4 does mostly everything Alexa on an Echo does (the new custom Blueprints aren't supported yet), but you'll need to use the separate Amazon Alexa app to download any skills to your account. The app doesn't come pre-installed, however, so Alexa newcomers will likely be confused by the Lenovo app's lack of direction. Alexa's splash screen is pretty lame and you can't customize it. You can opt to keep the screen on at all times, but unlike Amazon's Echo Show or Spot, which displays a rotating set of informative screens, there's nothing here other than the status and navigation bars, a picture of a coffee mug, and the words "Ask Alexa" in the middle of the screen. Without an option to change the picture or add a prominent clock, there's no reason to keep the screen on when not in use. Things are a little better when it has something to do. When Alexa answers a query such as a weather report or the capital of Norway, the Tab 4 displays a nice graphic that sticks around until the next command is issued. Music is represented by a picture of the album, but if you were hoping to use your Home Assistant Pack as a karaoke machine like the Echo Show or Spot, I have bad news: the Tab 4 doesn't display lyrics. Sound quality is on par with a regular Echo, which is to say it's treble-heavy and tinny. Should you buy a Tab 4 8 Plus and a Home Assistant Pack? Overall, Alexa on the Tab 4 8 Plus with the Home Assistant Pack is inferior to the Echo Dot. Echoes in other rooms often responded before the Tab 4, and when it did, it answered slightly slower than the other Echoes in my house. Plus it's awkwardly large for a counter or a nightstand. The screen on the Lenovo Tab 4 8 Plus is good, but it picks up light and fingerprints. On its own, the Tab 4 is a fine tablet for $230, with a retina screen, excellent battery life, and LTE. But Android on tablets still pales in comparison to the experience on phones, and the Tab 4 is no exception. You're probably better off buying a Chromebook and an Echo Dot for around the same price. Many of the newer Chromebook models can run Android apps and Chrome OS is light-years better than tablet Android. And the Tab 4's screen doesn't really add much to the Alexa experience. If you're dead-set on getting an 8-inch tablet and really want to use it as a hands-free Alexa speaker when you're not watching movies or reading 1-star reviews on PCWorld, then you'll probably be happy with the Tab 4 8 Plus with the Home Assistant Pack. For everyone else, there are better ways to spend $300.